SAN ANTONIO (August 9, 2017)— Laurie Ann Guerrero is an award-winning Chicana poet, a former San Antonio Laureate and the Poet Laureate of Texas. The esteemed poet and literacy advocate can now add Texas A&M University-San Antonio writer-in-residence to her list of accolades. At the start of the fall 2017 semester, Guerrero will be a fully immersed faculty member. She will teach a contemporary American woman poets course, host numerous University writing workshops and mentor students while working on her next writing project. Guerrero is the author of two full collections of poetry and a chapbook. Her first collection, “Babies Under the Skin” won the 2007 Panhandler Chapbook Publishing Award. In 2012, her manuscript, “A Tongue in the Mouth of the Dying” was the winner of the Letras Latinas Andrés Montoya Poetry Prize and was published by Notre Dame. 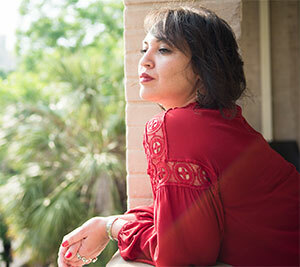 Poets & Writers Magazine named Guerrero as one of the top 10 poets of 2014, the same year San Antonio Mayor Julian Castro appointed her as the second Poet Laureate of the City of San Antonio. In 2016, she was appointed as the 53rd Poet Laureate of the State of Texas. For information about community writing workshop opportunities, please contact Sr. Communications Specialist Cavett McCrary at (210) 784-1103 or at cavett.mccrary@tamusa.edu. With a nearly 700-acre Main Campus to expand into, the Military Embracing™ university welcomed its inaugural class freshmen class in August 2016 and is now a comprehensive four-year university. Currently enrolling approximately 5,500 students, Texas A&M University-San Antonio is one of the fastest-growing universities in the state. To learn more, visit tamusa.edu.